Much of early 19th-century analysis rested uneasily on an intuitive notion of quantity that embraced all the measurable objects for which the natural numbers were inadequate, in particular lengths. 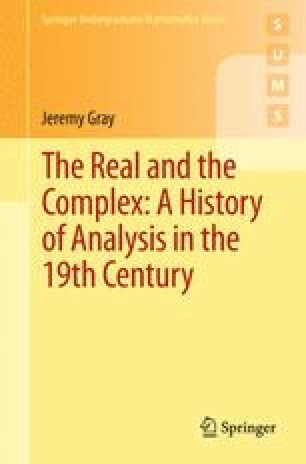 Real analysis was the study of real varying quantities, and at least informally it was compatible with infinite and infinitesimal magnitudes. Cauchy had redefined these infinite and infinitesimal magnitudes in terms of limits, but it was still unclear what the domain of real quantities comprised, and it struck several German mathematicians that complications in real analysis might be alleviated by providing a good definition of what the real numbers might be. Here we look at Weierstrass’s not entirely successful account, then at Dedekind’s more elegant version, and finally and very briefly at the theories of Cantor and Heine.